THE STORY - A 17-year-old trains to become a nun as the Roman Catholic Church undergoes radical changes in the early 1960s. THE GOOD - Phenomenal performances from the cast, especially Melissa Leo and Margaret Qualley. A thematically rich and powerful film that packs an emotional wallop. THE BAD - The message of the film does tend to get beat over your head a bit by the end due to the extended running time. Music is beautiful on its own but gets overused in the film. ​What does it mean to be a good and devoted Catholic? There are many different ways to answer that question. However, as depicted in Margaret Betts’ feature-length directorial debut “Novitiate,” the answer used to be more set and concrete before the reforms of Vatican II was officially implemented, thus changing hundreds of years of tradition within the Catholic church. The thematic and emotional power contained within “Novitiate” may resonate more strongly with Catholics but Betts packs enough into her screenplay to ensure that numerous people from different types of religions will find something interesting to latch on to. Taking place in 1964 at a time when the new rules of Vatican II (Which are withheld from the viewer until later on in the film) are being implemented throughout the Catholic Church, one such nun convent, run by Marie Saint Claire, or as she likes to be called “Mother Superior” (Melissa Leo), refuses to adhere to the new rules. Feeling that their fully devoted lives to Christ will be threatened by the new changes under Vatican II, the Mother Superior rules the very nature of the lives of all within the convent, proclaiming to be the voice of God. Utilizing old practices of penance involving starvation, physical punishment and public scolding, the path to becoming a nun, truly devoted to Christ, is one that many of the new women who come walking through the doors find difficult. One such woman named Cathleen (Margaret Qualley) has always been quiet, shy and has only found comfort in her relationship with God. Answering the call to become a nun against her single mother’s wishes (Julianne Nicholson), Cathleen and the other girls are tested like they have never been tested before to see if their devotion to God is truly as pure as they believe it is. “Whiplash but with Nuns.” This is the phrase that most accurately describes “Novitiate.” Much like how Miles Teller’s character in that film was driven to be perfect under the watchful and scornful eye of his master/teacher (J.K. Simmons in an Oscar-winning role), so too is Margaret Qualley under Melissa Leo. Leo, like Simmons, might also be the recipient of an Academy Award for her mesmerizing work here. Already an Academy Award winner for “The Fighter,” her work as the strict and devout Mother Superior is transfixing, unpredictable and quite moving at times. Even though she is often displayed as a monster, Betts provides her character with enough humanity on the page, thus giving Leo the freedom to express the character three-dimensionally to the audience. The effect works so well that a particular scene that she holds in the third act, managed to bring audience members to tears due to how powerful her work is. I would venture to say it is her best performance and one that will stay with you long after the credits roll. Also, just as how the praise for acting was mostly thrust upon J.K. Simmons in “Whiplash” thus leaving Miles Teller with no awards love so too I think will be the fate of Margaret Qualley playing the unshakeable and truly devoted young woman entering into the Novitiate at seventeen years of age. She is just as equally deserving of praise as Melissa Leo is with how much she commits emotionally to her performance. One scene in particular known as “the chapter of faults” involves her crawling on her hands and knees begging the other aspiring nuns in her convent for forgiveness, the effect of which is absolutely shattering as we see the toll the commitment is taking on the character and on the actress. Individual moments for other members of the cast to show their dramatic chops are scattered throughout but when all is said and done, its Leo and Qualley that you walk away thinking about the most. 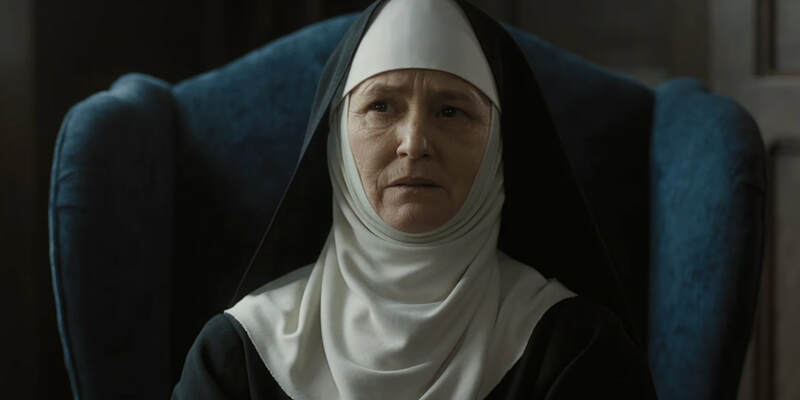 Sharing similarities to the military and prison, the Novitiate is a place where parent’s children go to die and be reborn as “brides of Christ.” To depict such a process, regiment and internal struggle for these women is a fascinating experience which Margaret Betts brings to the screen. The thematic exploration of one's devotion to Christ, especially under such difficult distress is well explored both on the page and on screen by Betts and her ensemble. It’s well shot, features a beautiful piano, string and choir heavy score (That is pleasant to listen to on its own but does get overused a bit in the film) and contains some of the best acting you’ll see on screen this year (Except for Chris Zylka's one scene as Cathleen's deserter father, who has one cringeworthy argument scene with Julianne Nicholson that feels too forced). However, its message and telegraphed ending do become a bit too obvious by the time we reach the third act. At over two hours, it’s easy to see how at least twenty minutes of footage could have found its way on the cutting room floor, allowing for a tighter film overall that doesn’t feel like it’s blasting you with its message constantly by the third act. Despite these faults, I remain eager to see what Margaret Betts has in store for us with her next film.